I'm so happy to let you know that Print then Cut will be launched the week of September 22nd, 2014! I've been lucky enough to have been given the opportunity to beta test the new features for the last couple of months and I'd like to quickly go over them here! So, obviously the biggest new feature is the Print then Cut. So what does that actually mean? 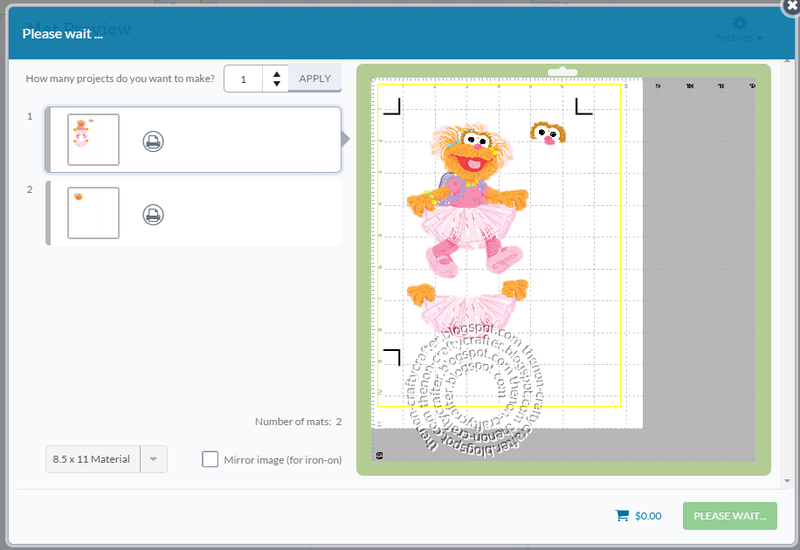 Quite simply, you'll be able to take pretty much any image (Cricut or imported) into Design Space, print it out then have the Explore cut it! When it's released you will be prompted to install a new Design Space plug in. You'll also need to do a firmware update on your Explore. Once that's done you'll do a calibration of your Explore. Don't worry... it takes you through it step by step! There are even lots of images that are "Print Ready" available. 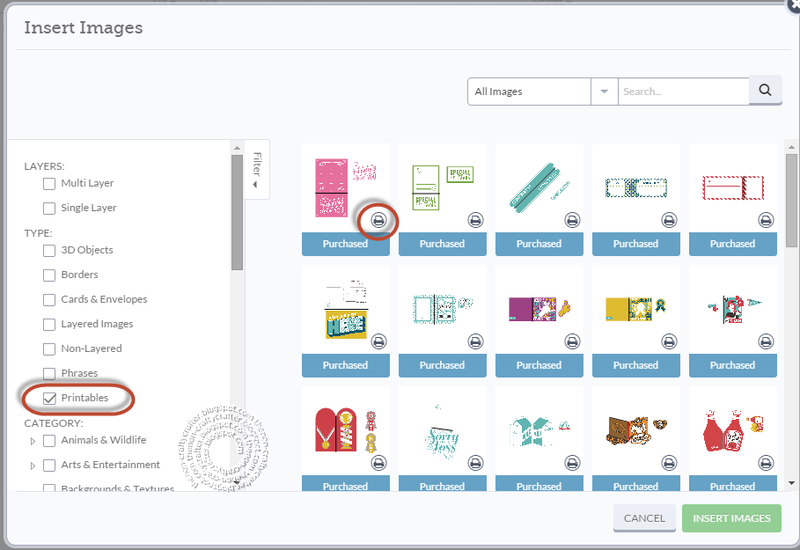 Just click Insert Images, then with All Images selected click on the Filter and check the Printables box. 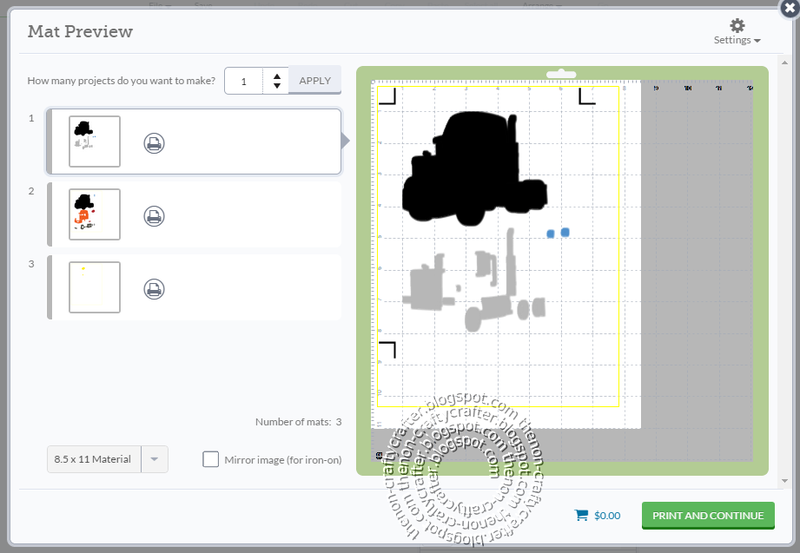 Select an image, resize it then press Go and follow the instructions. It's that easy! Keep in mind that currently Print then Cut is limited to 8.5" x 11" so you'll have to keep your image smaller than that to stay within the registration marks. You will get an error message if your image is too big. Some of the layers will be separated so you can give your project some dimension. When you're at the Mat Preview screen you'll see a Settings button in to top right corner. Click on that and you'll see the option to "bleed". 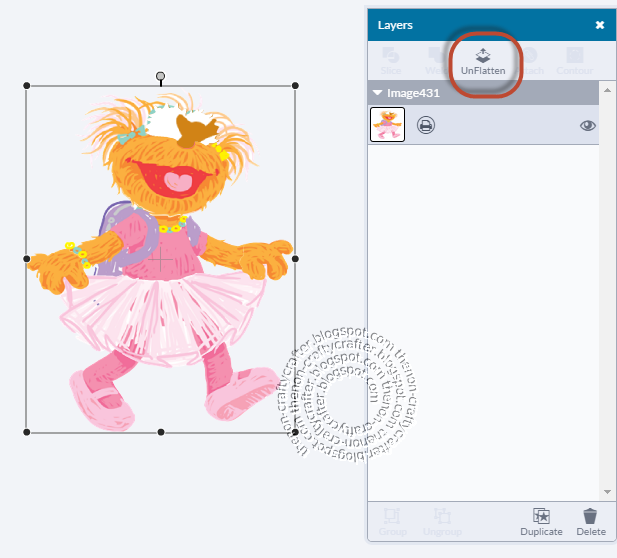 Bleed prints a border around your image which allows for more precise cutting. So, what else is new in Design Space? 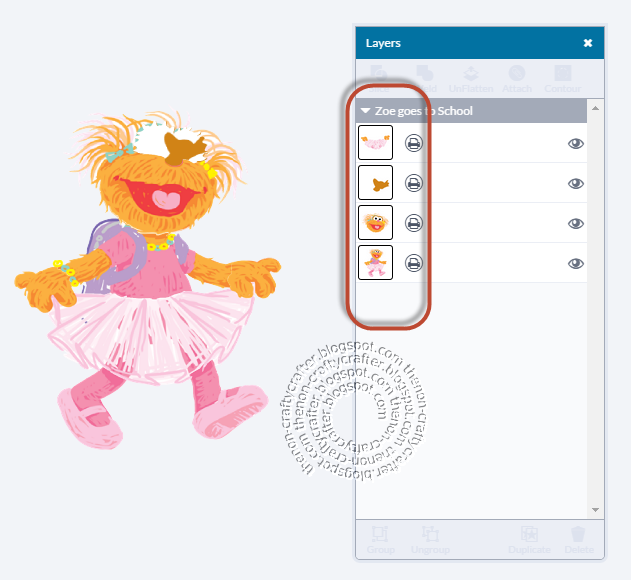 You'll find there are new icons in the Layers box. A great new addition to Design Space is the Slice tool. Remember all those times you've wanted to cut something off or out of an object? Well, now you can! You can turn a circle into a semi-circle. Or create a frame by placing one image on top of another. (Previously achieved by using Weld). Using the Slice tool I was able to create this swing card. I'll have a full tutorial soon on how to create this card! Not a new tool, but the way Weld works has changed. Previously if you placed one image inside another image and welded, the smaller image would be cut out of the larger image. Now if you do the same process the smaller image is fully absorbed into the larger image. So how do you achieve the same result as the old weld? You use the slice tool instead! Overlapping images and welding still works in the same way though. 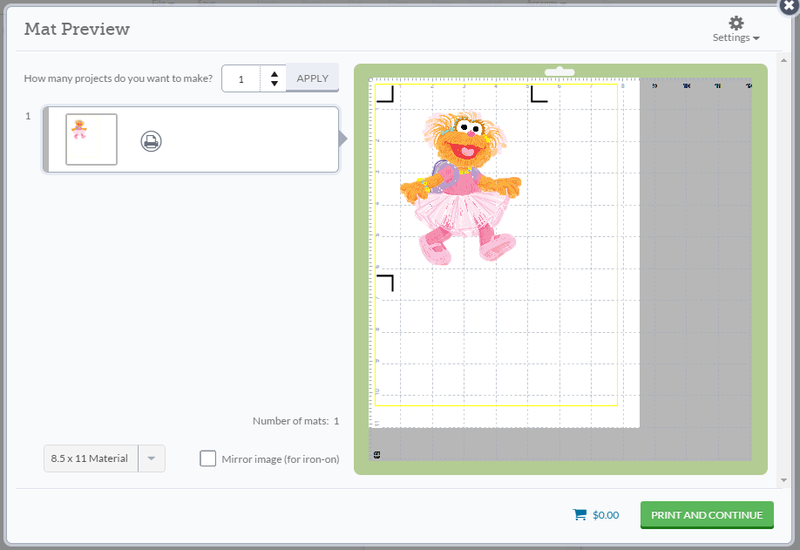 Take any image and turn it into a one layered printable image. Then cut around that image. Here's what the Mat Preview looks like when the above image hasn't been flattened. All the layers are separated and cut as you're used to. Here's what the Mat Preview looks like when the image has been flattened.You can see the registration marks on the Mat Preview. You can see that there's two layers showing. The first layer will be printed and then the Explore will cut around it. The second layer is a cut only layer and is the shadow for this image. Cutting it is totally optional. Don't like flat images? No problem. 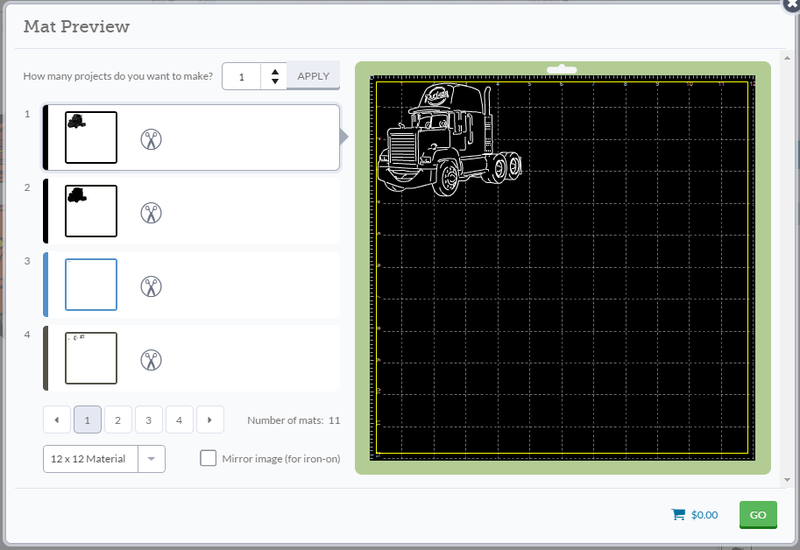 You can still use the Print then Cut feature to print each layer then cut it. 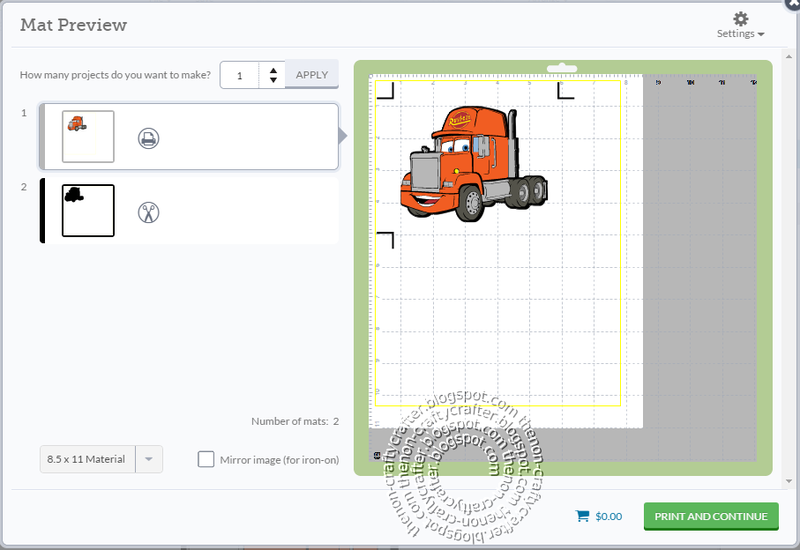 Instead of clicking Flatten you can go to the Layers menu and change the Cut icon to a Print Icon. 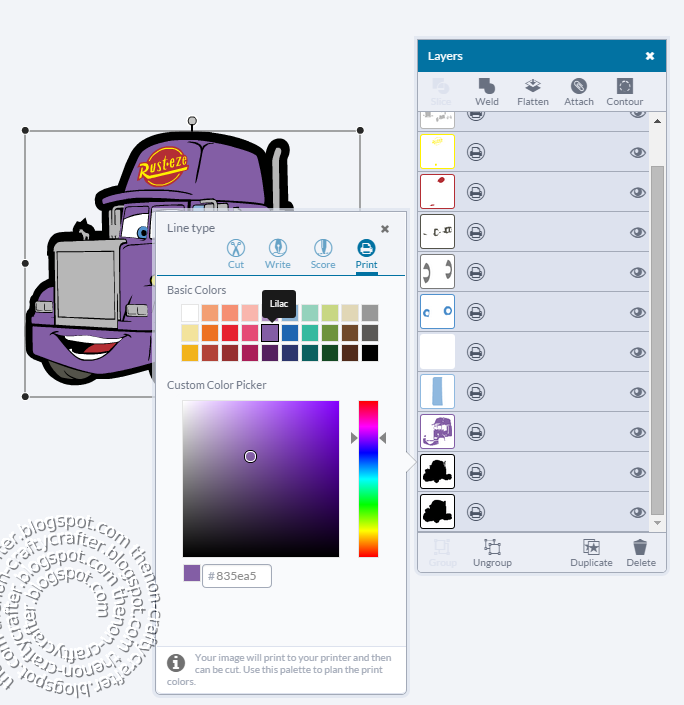 You can see in the picture below I have changed the first 3 icons to Print icons so far. When finished this is what your Mat Preview will look like. Once you press Print and Continue all three mats will be sent to your printer to be printed and you will then place them one at a time on the cutting mat. A great feature of changing the cutting icon to a printing icon is that you can change the colours of any or all of the layers. 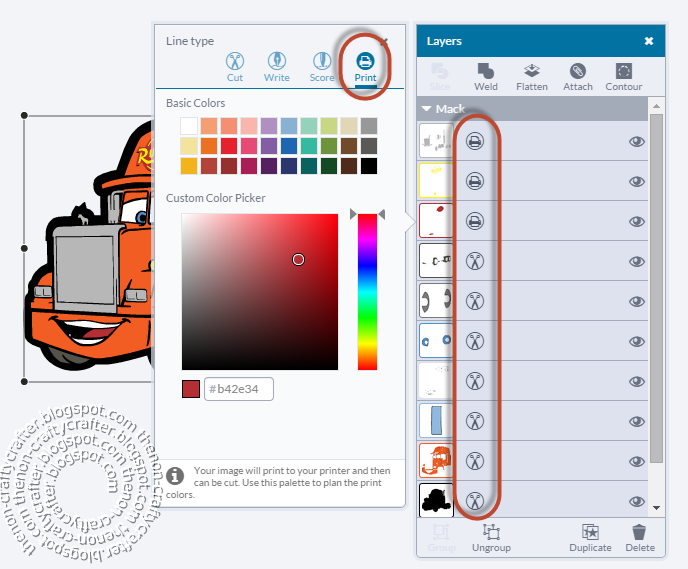 Just click on a layer in the Layers box then select the colour you want from the Custom Color Picker. Not a new tool, but the Detach option has been added to the Layers box so you don't have to go digging for it in the drop down menu when you right click on an object. Well, now when you click on an object and hold an arrow key down on your keyboard the image will keep moving. No more click click click click....! And.... for those of us that don't live in the USA, Print then Cut works perfectly with our A4 paper! That's all for now... but stay tuned for more in depth tutorials! Rock on Narelle! Thanks for the overview! Looking forward to your tutorials. I can't wait til it's released to us grunts to play! Awesome Awesome well written and easy to understand without all the minutia I get from other peoples blogs!!! Thanks for this valuable preview. Can't wait to start "playing" with these new features. Thank you! Your explanations and screen shots make it so easy to understand! Thanks Narelle! This is going to be wonderful! I can't wait for all the new features! Thanks for the info on new features! Super helpful! Thank you so much!! I can see Disney princesses with their teeny tiny eyeballs being a breeze with these new features!!! AWESOME AWESOME AWESOME. Thanks Narelle, great overview of the new features. Now I can get rid of that big paperweight of a machine. I am so excited, I love my Imagine but was frustrating to use. Some great updates, gives us hope that they are listening to our requests. PC rocks! You do an awesome blog post.Thank you! Thanks Narelle...great post and tutorial..right to the point. Super! Thank you Narelle, I'm so excited for all these news features!! I'm just giddy LOL.Like a little kid at Christmas time. Thanks for your great tutorial. Hi - Can you post a tutorial for the swing card image you share? I want to be able to create my own shaped swing card in DS. Thanks so much for your tutorials to learn how to figure ideas out! I saw in your post that we are limited to 8.5 x 11 print and cut size. I made sure my image was smaller than that (even down to 6") and it is still saying it is too large. 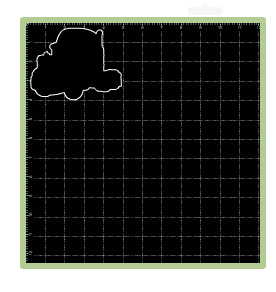 I was just trying to make a border on my cricut (just a simple dot border), and I can't figure it out! Any ideas would be much appreciated! Thank you! Thank you so much for your tip on how to turn off the bleed. I searched google high and low and was about to give up when I found your tip. Thank you, Thank you, Thank you! CRICUT: Print then Cut is live!